The Porter Airlines DHC‑8‑402 aircraft, operating as flight 1480, departed Halifax/Stanfield International Airport (CYHZ), Nova Scotia, bound for Montréal/Pierre Elliott Trudeau International Airport (CYUL), Quebec, with 2 flight crew members, 2 cabin crew members, and 72 passengers on board. At about 09:22, while in cruise flight approximately 45 nautical miles (nm) southwest of Fredericton International Airport (CYFC), New Brunswick, passengers alerted the cabin crew to a burning odour and sparks emanating from behind the overhead bin near the cabin wall above seat 14A, on the left side of the cabin. 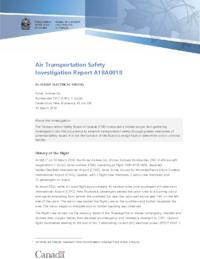 The cabin crew alerted the flight crew to the condition and further inspected the area. The odour began to dissipate and no further sparking was observed. The flight crew carried out the memory items of the “fuselage fire or smoke” emergency checklist and donned their oxygen masks, then declared an emergency and initiated a diversion to CYFC. Caution lights illuminated relating to the loss of No. 1 alternating current (AC) electrical power (PITOT HEAT 1, ENGINE ADAPT HEAT 1, LEFT TRU, and PUSHER SYSTEM FAIL), and other caution lights flickered momentarily. Once on approach to CYFC, the aircraft travelled through an area of icing, after which caution messages were received indicating that there was an indicated airspeed mismatch, and that the yaw dampener and autopilot had been disconnected. These messages are consistent with a blocked pitot tube and require that the flight crew manually fly the aircraft and identify which airspeed indication was accurate (the one on the left or the one on the right). In this occurrence, the flight crew were able to determine that the left airspeed indication was incorrect. The inaccuracy was later determined to likely have been caused by the left pitot tube becoming partially blocked by ice formation due to the loss of AC current to the pitot heating element. The aircraft landed on runway 09 at CYFC at 09:51 without further incident and came to a stop on the runway with airport rescue and firefighting personnel standing by. The cabin crew informed passengers that they would exit the aircraft through the normal cabin door and told them that they should take only jackets and phones; all baggage and other belongings were to be left behind. The flight crew shut down the aircraft and initiated a rapid deplanement. Passengers quickly exited the aircraft onto the runway as instructed and no injuries were reported. The passengers were then transported to the terminal by bus. In this occurrence, the cause of the electrical short circuit was not identified. Although electrical arcing damage consistent with previous occurrences was found, the wiring alignment was correct and the bend radius of the wiring was within manufacturer specifications, suggesting that these conditions alone may not be the sole source of the electrical faults and heat damage in the AC power feeder connectors.